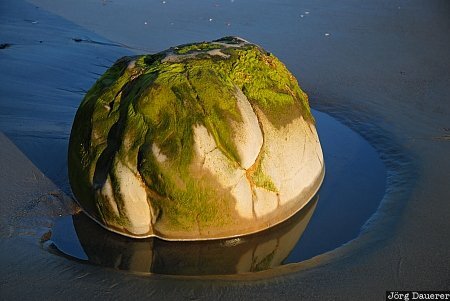 An algae covered rock of the Moeraki Boulders and its reflexion in a small tide pool on the beach of the Pacific Ocean in soft morning light, Otago, on the south island of New Zealand. This photo was taken in the morning of a sunny day in November of 2008. This photo was taken with a digital camera.